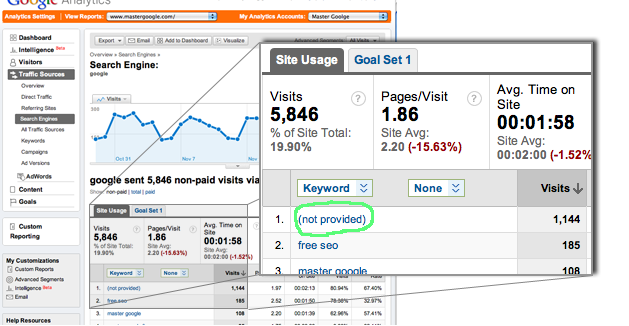 What Is “(Not Provided)” in Organic Search Traffic Keywords on Google Analytics? For about two months we’ve noticed a (Not Provided) item on Google Analytics traffic reports under “Traffic Sources/Google Organic” section. This is an article that has done a good job explaining it. The basic answer is that the keywords surfers used to find this particular site were not shown because the searchers were logged into their Google account when conducting the search. Google wants to further protect their users’ privacy by encrypting their search results pages (through https://www.google.com). In Nov. our site received 1,144 visitors from organic Google search which their search keywords were not shown (see below). This is 19.6% of our total Google organic search traffic. The numbers are similar across the board for our other clients. The fact that we are running blind for about 20% of our total Google organic search traffic is creating a bit of frustration for our team. Mainly because we’re unable to show our clients (or our team) what keywords were used when the site was found on Google organic search traffic with 100% certainty (as we did prior to Oct.). However, since the total number of organic search traffic has not been effected, we can use the other keywords to get a clear understanding of what keywords people search to find a particular site. My opinion is that Google needs to find a way to fully show the keywords people use in finding sites. Otherwise, we may have to use other software to monitor our clients’ traffic.